Glass splashbacks are easy to clean, hygienic and offer a colourful alternative to normal tiles. Usually consisting of 6mm Toughened Glass and coated with a coloured backing they provide a sleek and attractive finish unmatched by any other product. Each splashback is custom made to ensure the sizes are a perfect fit for your kitchen. Valiant Glass supplies and installs glass splashbacks throughout the Sydney metropolitan area in both homes and commercial properties. As glass specialists with over 35years experience in the glass industry our qualified glaziers carry out all glass installations complying with current Australian Standards. Colour – Glass splashbacks can be manufactured in almost any colour. We can produce splashbacks in any Dulux colour . Cleaning – As one continuous surface, glass is easily wiped clean with any glass cleaner and cloth. Space – The reflective nature of glass provides a mirror type finish, which adds depth, therefore making any room appear larger. Modern – The sleek and modern appearance of glass fits into current interior designs. Glass splashbacks can be combined with timber or polyurethane cupboards, granite or caesar stone bench tops and stainless steel appliances. 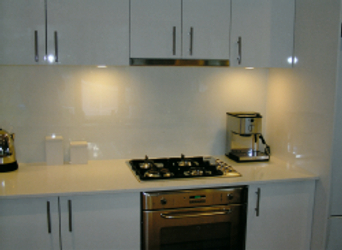 Size – Glass splashbacks are available in large sizes to cater to all types of kitchens. Wall to wall and bench top to ceiling panels are possible in many situations. If you’re looking for glass splashbacks in Sydney, call your local Valiant office to find out more about the advantages of kitchen glass splashbacks.